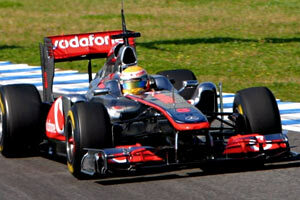 McLaren launched their 2011 car in Berlin on 4 February, one day after the end of the year's first winter test. Contrary to most other teams, McLaren decided there to run their old car, the McLaren MP4-25 to evaluate the new Pirelli tyres. The Woking based team went for an aggressive development route to tackle the changed regulations. The longer wheelbase and U-shaped sidepods are some of the most obvious examples. Director of engineering Tim Goss explained: "The thinking behind that is to feed as much good-quality air as possible to the rear-lower mainplane and the floor of the car. We want to get the rear-end working as well as possible following the loss of performance caused by the banning of the double-diffuser." Another important change is the addition of KERS, after it was banned in 2010. The new Mercedes-Benz designed unit is now a single integrated unit that sits within the survival cell, beneath the fuel-tank. In 2009, it was housed in the sidepods..
At the front of the car, the new McLaren features a nose that is raised even further, with a nearly flat profile from its top until the driver's helmet. By retaining the snow plow under the nose - an aerodynamic splitter attached under the nosecone - it is now the only car to feature such a device. The front suspension has been slightly changed in accordance with the new monocoque, but the steering rack is still positioned low in the nose. Behind the driver, everything has dramatically changed, not the least the cooling concepts of the car. Right under the airbox which provides air to the engine is a small intake to cool the batterypack and motor of the KERS system. Behind the airbox is an additional intake to cool the gearbox and hydraulics, all sitting behind the engine. The sidepods have also been designed in a particular manner, with an undercut to provide a steady airflow onto the upside of the diffuser. The upside of the sidepods are L-shaped with the cooling radiators inside them custom cut to perfectly fit the unusual shape. The new rear pullrod suspension also allowed the sidepods to slope down more towards the rear of the car, similar to what Red Bull brought the double championship win with their Red Bull RB6 in 2010. Finally, the engine exhausts are something which McLaren think is one of the most vital elements of the 2011 car. With dummy exhausts on the car at the launch, the team came to their first Jerez test with 3 different configuration of exhausts, and were running them at different moments to evaluate each solution. Tim Goss and Paddy Lowe explained more: Technical talk with Lowe and Goss.